In regard to the CANLOAN BDs at the CWM, Ed is probably right when he says the "surviving fully badged BD are from those units, either in Canada or overseas which were in existance in 1945 and reflect the badging practices at that time." I know of several museums which have extensive uniform and helmet collections tucked away in their storage facilities. Who knows what survives in these collections. I always ask myself two questions, Is it possible and Is it probable? Is it possible a Dieppe BD exists?, yes. Is it probable a Dieppe BD exists?, no. There is one more possibility which we need to consider. A civilian in Dieppe may have picked up/acquired a BD after the raid and kept it. Such a BD could be in a French collection which we don't know about. I know of several helmets from the raid which are in private collections. 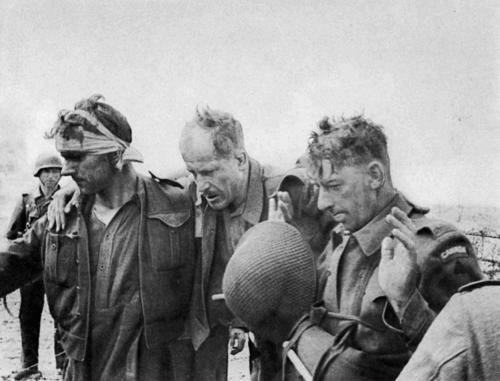 Wounded Canadians captured during the Dieppe Raid (Operation Jubilee), August 1942. My original question "What is the Rarest WW II Canadian Battle Dress?" doesn't specify Army BDs. Even though it might be opening a Pandora's Box, would should probably include RCAF and RCN BDs. I know very little about RCAF and RCN battle dress, and other members of the forum will have weigh in on this subject. No longer in my collection but a blue BD owned and worn by a Canadian RCNVR Lieutenant who was a pilot in the Fleet Air Arm and served on the Formidable with Hammy Grey VC. He went on to win the DSC. Nothing special to the BD other than his rank (RCNVR boards with string attachments) and his FAA wings worn on the left breast. Bill wrote: Hi Adam, I have no idea about an answer to your question, but your post brings another question to mind. 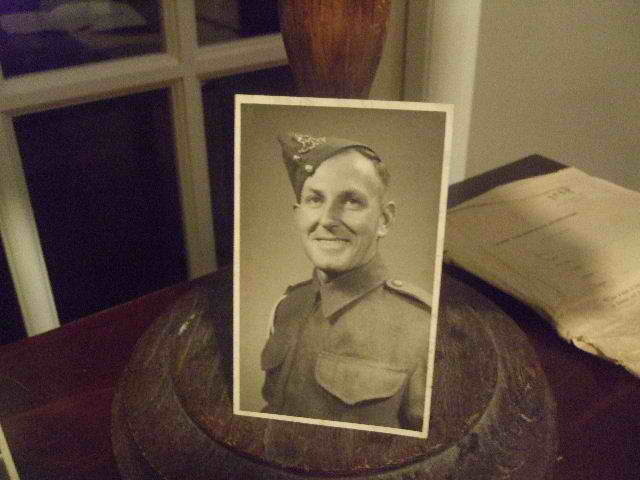 Does the CWM have a complete collection of Second World War Canadian army BD? The Canloan are well represented, but are other units? I don't see this as being their mandate. To own one of each unit would be nice but who has the room? There would be hundreds of BD which differ only in the badging. If you take into account the different badge regimes in the SWW you would multiply this total by 2-3. Then, if you do it for BD why not Service Dress? Then, if you do it for the SWW then you must do it for the FWW, Victorian Militia, Postwar, etc.. There would be no end to it. This battle dress blouse belonged to Lieutenant Dudley Rayburn, a beachmaster with the Royal Canadian Navy's Beach Commando "W". Created in early 1944, Beach Commando "W" went to France in early July 1944. Rayburn, a naval reservist since his youth in the 1920s, was a beachmaster who oversaw operations on a sector of Juno Beach. 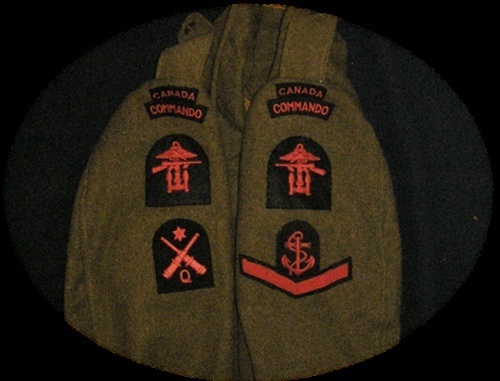 The left sleeve of his battle dress blouse carries "Canada" and "Commando" flashes (top). A Combined Operations patch (bottom) with an anchor, sub-machine gun, and eagle represent the navy, army, and air force operating together. 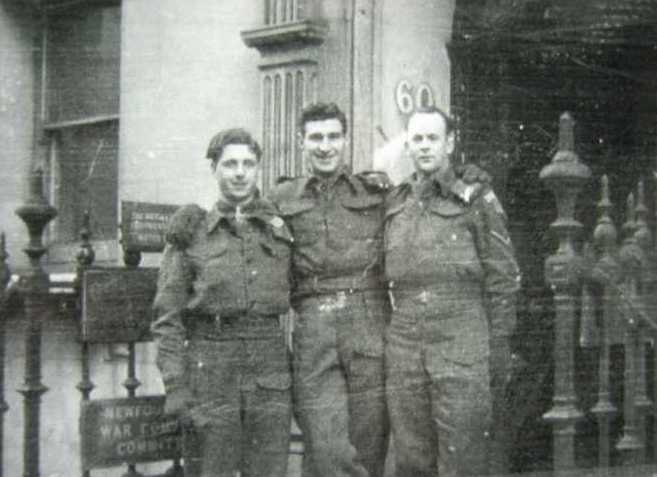 Three soldiers of the newly formed Berlin Battalion in 1945. 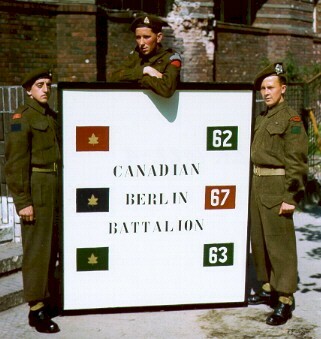 Fusilier Desfosses (Les Fusilier Mont Royal), Private Max DeForest (Loyal Edmonton Regiment) and Private Bob Jane (Argyll and Sutherland Highlanders of Canada) with a signboard showing the unit markings of their respective units, all of whom contributed to this occupation battalion. The photo shows the subtle differences in shades of the various Battle Dress garments; proof positive that no two uniform pieces are ever truly alike. Although it is held by the CWM, I would be highly suspecious of this RCN Beach Commando BD. The RCN Beach Command were issued clothing from British stores and from the large collection of imagery that I have, their BD was of British manufacture and not not Canadian. Secondly, surviving badged WWII Canadian Army BD are garments that the soldier wore home and was demobilized in and since RCN Beach Commando 'W' was disbanded in the late summer of 1944 and its members returned back to the RCN, then there would be no reason for member of this unit have a set of Canadian BD all tarted up for wear home. The 2000 acquisition date and the fact that this rather pristine Canadian BD is badged RCN Commando, but missing the all-important RCN rank, leads me to believe that this was put together years after thw war by or for a Veteran of this unit and possibly following his death was donated to the museum. The trouble with the on line selection of RCN artefacts is that the captions have been dumbed down and there is more empasis placed on naming the owner then an acedemic study of the garment and its components. The potential of electronic media is barely being exploited for in the case of this RCN Beach Commando tunic there could have been close-up detail images of the insigna and the garment label, a few archival images of the RCN Beach Commando wearing BD and a short history of the unit and its post D-Day activities on JUNO Beach. With this example all we get is one image of the tunic and a short, near useless blurb on the apparent owner and the insigna. Frankly, I would expect more from a national level military museum, but as well all know VCs and war art are the only artefacts that matter. Thanks Ed for your input on the RCN Beach Commando BD. Even though Newfoundland joined Canada in 1949, I think there BDs should be part of this thread. There was a Newfoundland Battledress from the 57th Nfld Hvy Regt RA (Later 166th Nfld Fd Regt RA) which was recently on ebay, to a British unit member not originally from Newfoundland. Bill, it's my understanding the Newfoundland Overseas Forest Unit and the 3rd Inverness (Newfoundland) Battalion [a Home Guard unit] wore BDs. Do you know what insignia they would have worn on their BDs? "Louis Walsh, as Cpl. L. A. Walsh, HQ Coy., was selected to represent the Battalion at the national Home Guard stand-down parade in London on Sunday December 3rd 1944. This honour was shared with two comrades, Cpl. Les Styles, "B" Coy. and L/Cpl. H. Wheeler, "A" Coy. These are thought to be the men (below) standing on either side of Louis that weekend somewhere in central London, in front of some government offices which appear to have a Newfoundland association - and which also indicate the general grubbiness of London after five years of war." Not to sound negative, but again I would also suspect this BD as having been made up. I have not studied the 57th Nfld Hvy Regt RA (Later 166th Nfld Fd Regt RA) nor seen this example in person but my gut tells me that this is a badged up Canadian BD tunic when I think it should be of British manaufacture. Again, a good look at the shoulder strap buttons or the label would help in this case. As well, when the British Army demobilized the indivdual soldiers were required to hand in their clothing and equipment in return for a demobilization suit. So if this was the case as well for the Newfoundland Heavy Regiment RA, then why would this example have survived? These RCN BD would certainly rank as rare and desirable. First, a Beach Master at Kiska and a full Commander at that. Note that he does not wear 'Canada' titles. Second, a group of RCN Commandos. Thanks for posting those great RCN BD photographs Clive. Putting regulations asids, I have acquired several documented BDs directly from British veterans. RCN Insignia follows that for the RN other than in national distinctions in the titles, either red on blue-black titles, one above reading ‘CANADA’ one below reading ‘COMMANDO’, seen stitched butted together to give the impression of a single title with Canada above Commando or with a roughly 1 ½” gap between the two titles. Another variation seen is a single title, white letters on a blue-black backing reading ‘ROYAL CANADIAN NAVY’. Canadian Navy Commandos wore both Canadian and British pattern BD, there is also photographic evidence of a motley mix of clothing being worn when off-duty or aboard ship waiting for landing operations including a rating wearing a blue (dyed?) battledress blouse and men wearing BD blouses with their rating’s bell-bottom trousers. Canadian Navy Commandos can be seen wearing the same headgear mentioned above but the Mk.III or ‘Turtle’ helmets seem to have been more widely issued and one photograph shows an officer with a US M1 helmet, all these helmets painted battleship grey. Helmet insignia in photos of RCN Commandos vary from names and Combined Operations insignia painted on the front to officer’s rank. Another US issue item seen in photos is the ubiquitous US Navy ‘pork pie’ white cotton cap, worn when off duty, in one photo apparently dyed grey or khaki. It is probable that Canadian Navy Commandos wore the same motley collection of footwear listed above but some also appear to have worn the Canadian ‘3rd Division’ boot, a taller boot with laces and a buckle fastening at the top and a hobnailed sole. Insignia of a Leading Seaman, Quarters Rating, 2nd Class, RCN 'W' Commando. I would be careful with that reenactor website as it is laced with misinformation and collector slang, plus the two illustrated BDs are both post-WWII rebadged examples. Websites are like books, you need to draw from several sources to get a more complete picture rather from just one unattributed source. Although not BD, I was quite surprised that this KD uniform survived with its insignia intact, although the fact that it had been the property of a Battalion CO perhaps explains how this happened. That is an amazing Bush Jacket, don't think that I have seen one with original insignia from WWII before. Thanks for posting such a great item. Do you know it is British made or Indian? Very large size as well, very nice and rare. Thanks for the reply. After some hard work, networking and luck i acquired the 166th Nfld Fd Regt RA BD above. I have yet to see it in hand, but i have a rock solid return policy. The facts behind this BD were that it came out of the UK in the 90s through a stamp collector and as was correctly stated it was to a member of the 166th who was posted into the regiment from the UK, not a Newfoundlander. It is apparently British made/labelled, 1943 dated, and named inside to the vet. 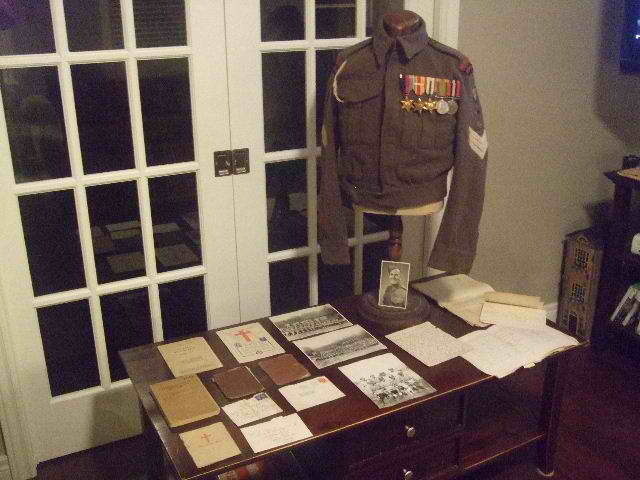 Originally only his paperwork and Medals were for sale and the first buyer (who only sold it to fund bigger Nfld WW1 purchases)managed to find out about the Tunic and got it as well. I have done some of my own homework, as i was concerned about the way the rank insignia was mounted so low and confirmed with a vet from the 166th that this is exactly as their BD were badged for functions. The insignia is all hand stitched it appears, the red/blue strip i'm not sure. As said I have to see it in hand yet. So this leads me to believe that this is a leave tunic/coming home tunic, also identical to course or some garrison photos, including the white land-yard. I have found in the mean time another photo of an NCO wearing the rank low like this is the 166th, as well as Tropical rank being worn in a marriage photo. With regards to No Newfoundland BD or Uniforms making it home more information is coming to light. I was told many years ago by a signaler of the 59th that when they went into Normandy they wore no insignia, and that they had to draw New Uniforms for a 1946 Victory parade. What is unclear is did Individuals come home and keep their Uniforms or did everyone keep their Uniforms. I have wrote the vet I know to ask this again. What I can say for certain is there are photos of Newfoundlanders on their way home during demob passing through Halifax, in full coming home style Uniform. The Uniforms which are in local outport/small town Museums in Newfoundland (Trinity x 2, Greenspond x 1, King cove x 1) are in this fashion, and one even appears to be a Combat Tunic. These BD were donated only from families in the outports years ago. There was in the mid 80s a 12th Corps badged Newfoundland BD as well in the Murray Premises. I confirmed last week from my aunt that both my uncles came home in their 59th Uniforms, in coming home fashion (Newfoundland over RA, 2nd Army patch, Red/Blue strip, chevrons on the sleeve and rank). I have to check where are these two tunics. My other Uncle came home in his RN Uniform which is apparently still with my aunt, Newfoundland badged. There is a Newfoundland RAF Uniform in my family as well that I could check on, and my Fathers uncle who stayed in the RAF until 1955 came home in Uniform, but this is a different story. Now what would be the rarest Newfoundland BD? My guess would be Newfoundlanders who served in other units of the British Forces, like the 5 who served in 11 Scottish Commando, the Royal navy Commando, the Chindits etc, all possibly Newfoundland badged? On the Newfoundland Grandbanks website is a photo of 4 Newfoundlanders of the 166th (one an MM) in Halifax, on the way home. The BD are the same configuration as some in Museums. As I am not allowed to post links yet for 7 days you will have to wait for the 2 photos, or maybe someone can help and post them. 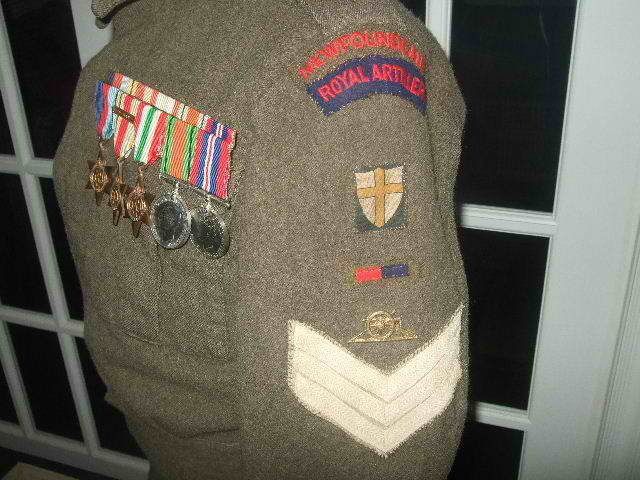 1 is a clearly combat worn Newfoundland BD and Beret. Again I cannot yet post a link to an article about Norman due to the 7 days rule. All "as they came off the boat in 1945" and donated by families from small outports to local museums. More to follow i hope from a vet. There are at least 3 more Known in Museums that i do not have photos for. One is clearly a Combat worn Battledress and Beret. I would love to hear some comments on these Newfoundland battledress blouses. I am still in the process of getting more photos from local veterans. There is a Combined Ops Newfoundland RN Jumper I am attempting to get photos of as well, with any luck. As is quite evident, everybody came back with their uniforms! 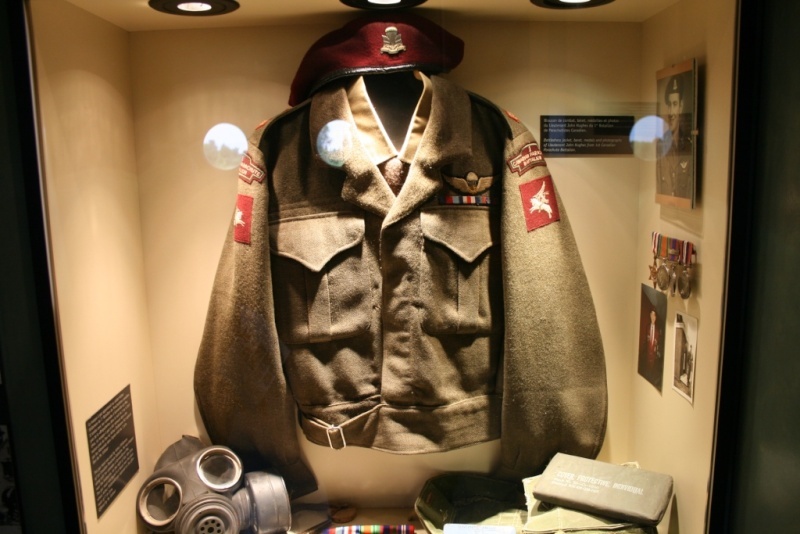 The rarest WWII Canadian battledress? Battle worn, small (not necessarily "special") unit members, and Victoria Cross winners. e.g. BD blouse worn by Padre Foote one the Dieppe Raid when he won the Victoria Cross. 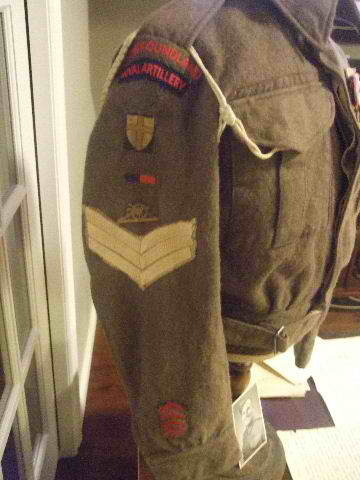 Definitely 1 Canadian Parachute Battalion BD blouses are rare but I have owned 4 over the years. I only have one now and I definietly want more - regretting now that I let my others go i.e. those of Sgt. Wally Krutow; Pte. Verne Haughian HQ Sigs; and Pte. Cliff Douglas C Coy). I have Pte. James Dillon's one (restored). He was captured on D-Day. CANLOAN blouses are very rare as there were only about 550 of them. I have Lieut. Jim Erskine's BD blouse (fully badged) and his Service Dress tunic (original collar badges and buttons, small brass CANADA shoulder titles replaced with my Dad's). Jim was from Vancouver and went into Arnhem on the first day commanding a platoon of D Company, 2 South Staffordshire Regiment. He was wounded on the third day of the battle (shot through both legs and one was amputated) and was taken Prisoner of War (PW). How about my Sgt. ranked Canadian Intelligence Corps BD blouse with British Troops in Siam formation patches. Not named (I HATE that! If these were RCN types they would have learned to put their name on EVERY bit of kit!) It is almost certainly for a Japanese-Canadian Interpreter. I have never heard or seen another one surviving. I have two very rare post-war battledress blouses that most collectors would want. They were worn by Smokey Smith, V.C. and I purhased them directly from his daughter and son, along with kilts and hats. One set is Black Watch (1950s) and the other set is Seaforth, including his Seaforth kilt - presumably the one he wore the day he received the Vicoria Cross. The Seaforth BD blouse is 1947 dated which is a puzzle - but it was HIS. I think we overlooked Winnipeg Grenadiers coming home BDs with HK patches.